"How do I drive more traffic to our website?" This is an extremely common question that clients come to us with and it's a good question. The more traffic you can get to your website, the more you can connect, engage and convert visitors into customers. 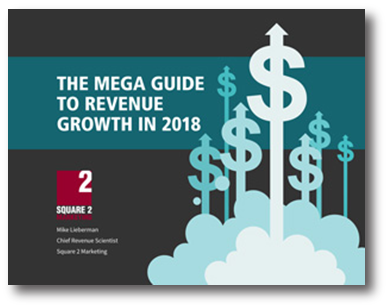 It's easier than you think to effectively drive a ton of traffic to your website, however, it's not going to happen overnight . With an Inbound Marketing strategy it is possible to ramp up your traffic to your website. I know this because last year we successfully skyrocketed our website traffic from 366 to 8000 visits in less than 12 months! In this short case study I'm going to explain some of the key things we did to help increase our website traffic and how you can leverage Inbound Marketing techniques to help boost your website too. In late 2011 we fully adopted an Inbound Marketing strategy. (learn more about Inbound Marketing) I was hired to help develop and grow this function within our agency. We were excited and motivated to embrace the Inbound Marketing mindset and wanted to become fully educated on the subject. I got Hubspot VAR Inbound Marketing certified, Google adwords and analytics certified, Hootsuite certified and completed about 3-4 other marketing related educational programs. With this new wealth of knowledge, we embarked on our Inbound Marketing journey. 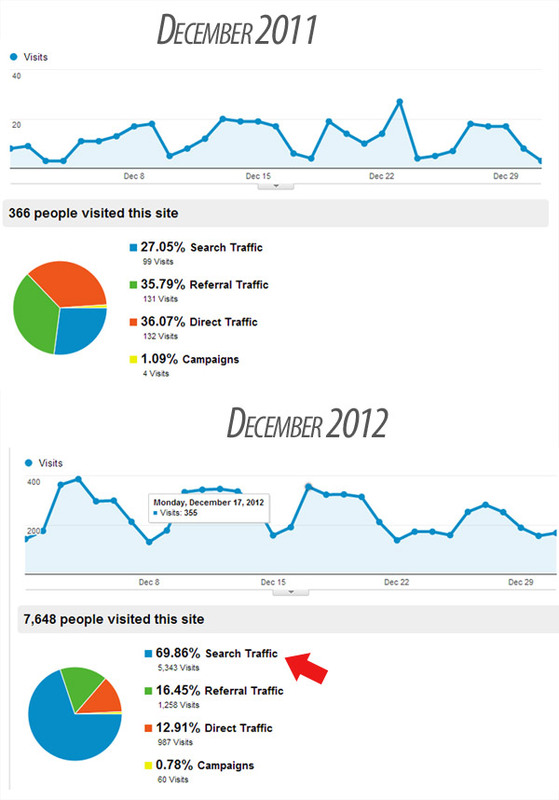 You can see when we first started our website traffic was nothing to show off. We received very few visits and most of those were coming from direct traffic a.k.a people who already knew about us. Powered by an Inbound Marketing strategy and mindset, we got started blogging. Blogging is no easy task and for many they either cannot make time for it or don't see the value in it. If you fall into this boat, pay attention to the next sentence carefully. Blogging is one of the most important things you can do in your marketing and overall business. Look at your blog as an asset to your business just like you would look at your I.P. portfolio as an asset. 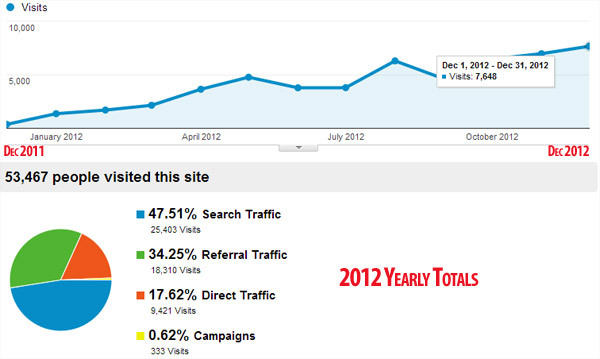 I can honestly say that our blog and resources area are one of the keys to our websites and overall business' growth in 2012. If you're not already doing it, make it a point to start blogging. In addition to our blog, we wanted to provide some great resources for people on our website. So we created a premium content download section and the Joomla top 100 extension list. The download section provides visitors with great information and content in the form of educational ebooks, webinars, check lists and white papers on Joomla and Inbound Marketing. As we were getting our blog and content rolling, we also adopted a new SEO strategy. We wanted all this great content to be easily found and show up at the top of Google when people searched. We optimized our website and started building great quality links from people linking to our great content and guest blogging on other well-known industry websites. These things, among others, make our site's content be easily found which drove our traffic coming from organic search up. 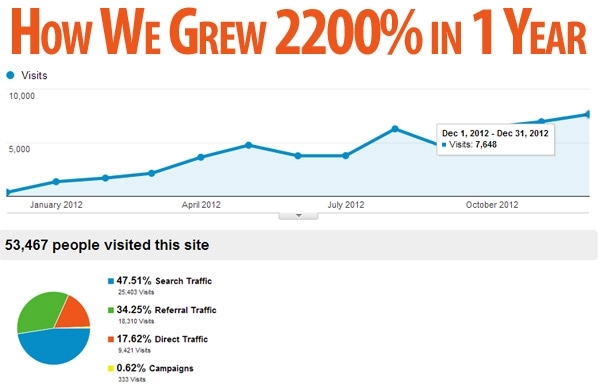 You can see that when we started we had a very low percentage of organic traffic. Only one year later, organic search traffic makes up a great chunk of our overall traffic coming to the website making up almost half of our traffic. Lastly, we became more active in our respective communities, Joomla and Inbound Marketing. We got involved in some of the working groups in Joomla including writing for the Joomla community magazine, continuing to organize the Joomla user group and being on the Joomla marketing team. We also actively participate in Hubspot webinars and round-tables and even started the Milwaukee Inbound Marketing user group. Whenever possible we attended events either as a speaker or an attendee including J!andBeyond in Germany, Joomla World Conference in San Jose and Inbound 2012, the big Hubspot Inbound Marketing conference in Boston. Conferences were a great place to network and promote some of the great things we had going on within our website. Additionally, attending conferences helped build on our education and knowledge. These were the major contributing factors, however, there were many other little things that also helped contribute to the increase in traffic. One driving force that I have not mentioned is the use of social media to help promote and drive traffic to the above listed activities. Social media played a big role in this whole process and also allowed us to develop personal relationships with our audience. Keep in mind, this traffic was not overnight. We had to spend countless hours developing and promoting our content over the year, but one year later you can see it is well worth the investment. Just like your business should be, Inbound Marketing is a marathon, not a sprint. Typically it takes around 9 months to start seeing the benefits, however, once they come they exponentially grow and are sustainable over time. One other thing we have not even talked about is converting those visitors into leads. 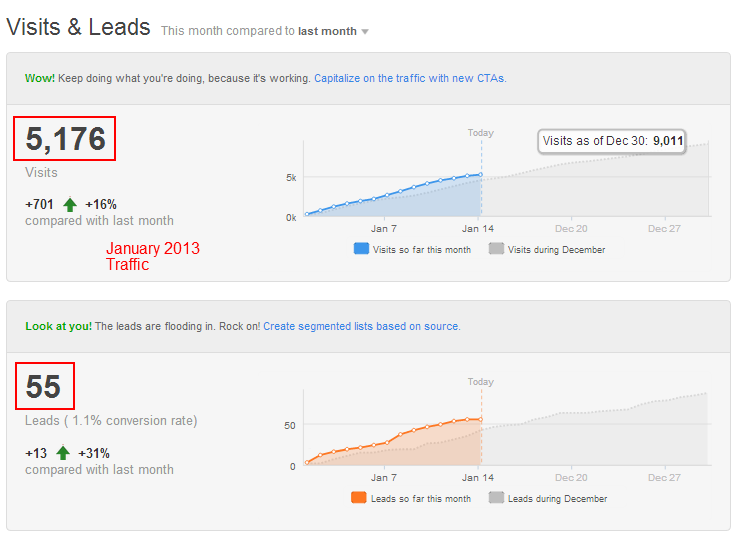 Before we started our Inbound Marketing strategy, we were receiving around 20 leads each month. One year later, we were bring in on average 100 leads, more than our sales staff could keep up with. A good problem to have. You must reinvent your business' culture, vision and mission into one that supports content creation and education by everyone on the team, not just marketing. You also have to change your mind-set to see content production as an investment vs. a chore. If you can do these steps along with creating a successful Inbound Marketing strategy, you too could skyrocket your website traffic and leads in less than one year. If there is something you're struggling with or have questions about, feel free to leave comments below or get a hold of me to chat. I'd love to talk.